VPR’s series of campaign debates continued Oct. 8 with the Attorney General’s race. VPR’s Jane Lindholm hosted the debate among the major party candidates. Liberty Union Rosemarie Jackowski, Democrat Bill Sorrell, Progressive Charlotte Dennett and Republican Karen Kerin squared off in a 60 minute debate that was broadcast live. 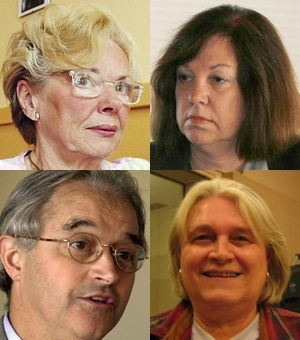 AP Photos/Toby Talbot: Liberty Union, Rosemarie Jackowski (top left), Democrat Bill Sorrell (bottom left), Progressive Charlotte Dennett (top right). Photo of Republican Karen Kerin (bottom left) by Jane Lindholm.